Shock waves are essentially non-linear waves that propagate at supersonic speeds. Any sudden release of energy will result in the formation of shock waves. In this study, we have shown for the first time that catheter, skin and lung biofilm infections can be treated using shock waves combined with antibiotics. Many bacteria secrete a highly hydrated framework of extracellular polymer matrix on encountering suitable substrates and embed within the matrix to form a biofilm. Bacterial biofilms are observed on many medical devices and on epithelial and endothelial surfaces during infection. For endocarditis, periodontitis and lung infections in cystic fibrosis patients, biofilms are an important mode of growth. Bacteria within the polymeric hydrogel matrix are protected from antibiotics, and antibiotic concentration of more than 1000 times of the MIC may be required to treat these infections. 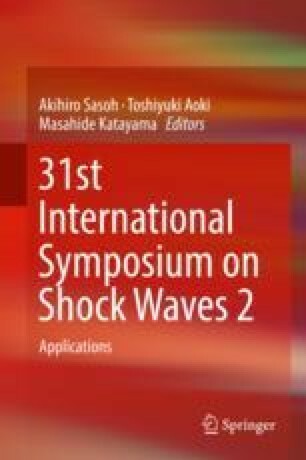 Here, we have demonstrated that shock waves can be used to remove Salmonella, Pseudomonas and Staphylococcus biofilms in urinary catheters. The studies were extended to a Pseudomonas chronic pneumonia lung infection model and Staphylococcus skin suture infection model in mice. The biofilm infections in mice, treated with shock waves, became susceptible to antibiotics, unlike untreated biofilms. Mice exposed to shock waves responded to ciprofloxacin treatment, while ciprofloxacin alone was ineffective in treating the infection. These results clearly demonstrate for the first time that shock waves, combined with antibiotic treatment, can be used to treat biofilm formation on medical devices as well as in situ infections.